Yuemey is creating an ecosystem for modern career networking, collaboration and recruiting that utilizes A.I., geo-location enabled groups, referral features, live events and social tools to help users make the right connections. 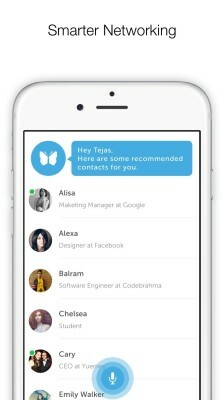 In contrast to networks like LinkedIn and Facebook that emphasize self-promotion and popularity, Yuemey takes the “work” out of networking by seamless access to quality contacts, events, information, discussions, and career opportunities. Yuemey has experienced early success by onboarding established groups who are utilizing the app to scale their communities, galvanize greater member engagement, and maintain community connections between virtual and live events. 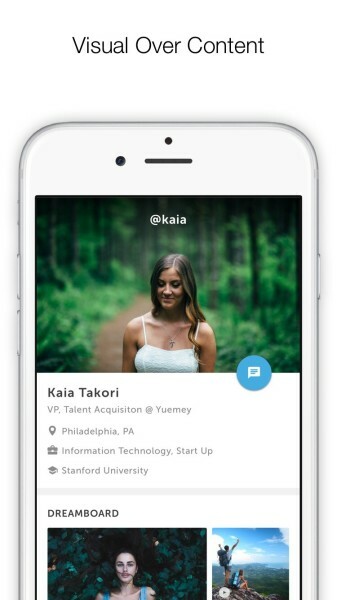 Yuemey makes navigating career relationships natural and easy and sign-up is instantaneous. 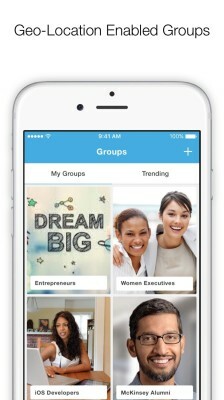 Once the app launches the Geo-location enabled group feature helps members discover or create groups nearby. 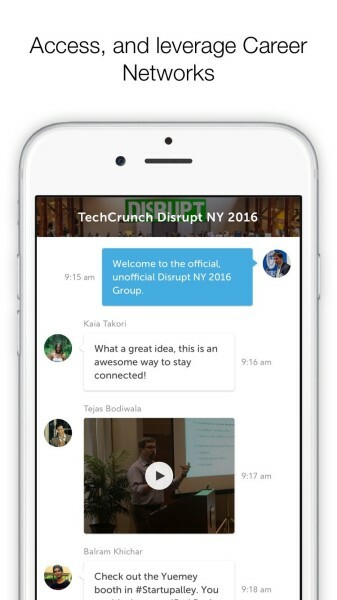 Members in groups can chat on trending topics called Convos, call members out with mentions (@ symbol), or chat privately. To engage in more personal conversations members can also FaceTime straight from their profiles. And when it comes to Yuemey profiles: Visual is in. Content is out. The power of thought looms large with a visual Dreamboard that provides an innovative alternative for professionals to showcase their passions, stories, sources of inspiration, skills and experiences. Check out their website www.yuemey.com and download the Yuemey app from the App Store. It is fun, exciting and easy to use. Start Yuemeying! Funded: Yes, Yuemey has raised a ‘friends and family’ round from Stanford alumni. Raising Additional Funding: Yes, the company is looking to raise between $500k and $2m to focus on user adoption and building out the service and team. Revenue: Yuemey is pre revenue. Potential Customers: Yuemey is developing multiple enterprise solutions for companies to recruit and engage talent as well as consumer products for members to navigate relationships more efficiently. Market Size: Continuing to grow from $3b in 2015 to $23b in 2020. Market Shift: In favor. More and more professional and social networking is done with virtual solutions. In addition to meeting this need Yuemey is also building out novel ways to foster and maintain connections across live events and virtual communities. Are you Hiring: Yes, Yuemey is always looking for talent in enterprise sales, viral marketing, and mobile development. Email info@yuemey.com for inquiries. I sat down with Cary Weir Lytle, co-founder and CEO of Yuemey, who has a unique background in talent development and recruitment. He has worked in recruiting for Bentley University, developed national talent pipelines and networks for organizations like ALPFA, and created Brandeis University’s undergraduate recruiting platform. Cary’s experiences and skills have equipped him to revolutionize professional networking. Yuemey’s other co-founder is Tejas Bodiwala who serves as CPO/CTO. Tejas started his career as a software developer and quickly fostered an acumen for business analysis, product design, and mobile strategy at companies like eBay, Chase, Comcast, and Merck. Tejas is Yuemey’s ultimate product owner and is using his background in both enterprise solutions and B2C products to build innovative and monetizable features. According to Weir Lytle, “The reality is that today’s platforms for networking, collaboration and career advancement are outdated and inefficient. Yuemey takes the ‘work’ out of networking with products and features that help members use their time connecting rather than working endlessly just to speak with a potential contact.” In fact, Yuemey is already working on a voice enabled personal career assistant - using artificial intelligence - that will help members meet the right people, groups and companies as well as schedule meetings and RSVP for events and appointments – along with similar enterprise solutions for companies to brand themselves, leverage referral networks, and recruit.